With Monday being the last day for filing nominations, many candidates thronged the office of the election officer. 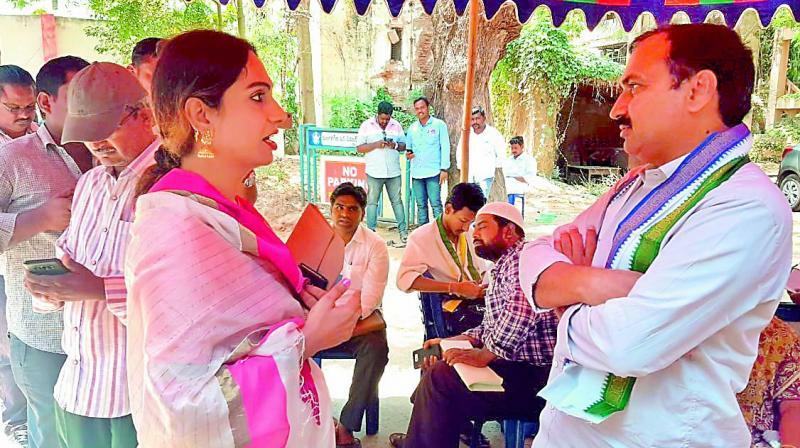 Vijayawada: Transgender Tamanna Simhadri filed nomination on Monday for the Mangalagiri Assembly seat, from where minister for IT N. Lokesh is also contesting. Speaking to mediapersons after filing her nomination papers, as an independent, she dared minister Nara Lokesh to contest the polls by resigning to his MLC and minister posts, if he is confident of winning the seat. Tamanna said she was the first transgender in the state to contest the elections. She appealed to the voters in Mangalagiri constituency to support her and vote for her to enable her to serve them. She said that she had submitted application seeking Jana Sena ticket to contest from Mangalagiri but that the party denied to issue it. “So, I decided to contest as an independent,” she said. She predicted that TD’s Nara Lokesh will get defeated in the elections. She said that she was contesting the polls as no political party was giving importance to them. In such a case, transgenders need to be represented both in the Assembly and Parliament to get their problems resolved.